One thing that has surprised me as I look into this series is a general lack of information into the way lives were lived during the Middle ages. we have information on the big picture events, and we have plenty of information on nobles and clergy, but when it comes to the little guys, the every day people, there is so little real information without delving into scholarly works, at least. So, here I am going to go a lot on some common information, some not so common information, and general concepts. I am sorry if this isn’t up to par. I have gone over Manoralism in a greater sense, I wanted to dig down in to how people lived, what type of buildings they have, and where they would spend most of their time. I’ve got some Visual Aids this time, thanks to Thinklink and others: The images will link right to their sites! I like this image because, To my knowledge, this really shows the relationship of a manor, its houses, and its fields. Houses weren’t, often, homesteads far away from others and fairly isolated. Instead, they were, while not urban, communal. We hear a lot of talk about the fact that 85% of the population int he Middle Ages was rural, but our visions of rural in these days, and often in America, are of the hearty, do it alone frontiersman of the 18th and 19th centuries, but that is simply not true. living in town was the most common existience, with a long commute to work the fields and pastures, something many of us in the modern area can relate to. I say this because many of the images we get from our understanding of the peasant life don’t make sense unless we have the knowledge that there was a town baker, who would bake the raised bread made by the peasants for a fee, a town blacksmith, a common well, a mill, and a church people were expected to attend on Sundays. This only makes sense if people live close to each other, especially when you take into account the fact that most of the houses we are told about are one room, one-story affairs. There was no place to bake, brew or forge, and many people didn’t have the knowledge or capacities to do it. Instead, they has their few livestock and a bit of food they grew on the land that they didn’t owe the Lord of the Manor. Lets take a look at a fairly common house, I love this picture because it so clearly illustrates what I’ve been talking about. This house is, in many instances, not a place to live, but simply a place to shelter from the weather and stay warm. 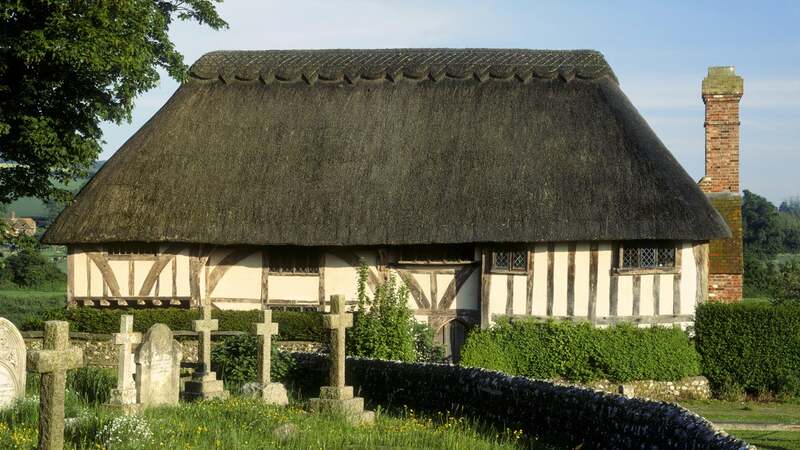 It has a large hearth, where the family would often center themselves around, a roof of thatch to keep out all but the absolute worst of weathers,the floor was just standard dirt and straw, with no flooring cover to be had. There were also no bathrooms, though that shouldn’t come as a surprise. Instead, they did their business in a bucket and tossed it in the local rivers the next day. These houses had but a single bed of straw for the whole family. If the Children were lucky, they had a loft to sleep in in the rafters. While the actual living conditions were basically squalor, the building was built very sturdy. It wasn’t stone and mortar, of course, but it was often fine and durable construction, meant to last generations with only regular maintenance. This article on the building materials of Middle Age houses was invaluable. Wattle and Daub is the most likely of the construction materials for any house, and its how we get the plaster-like type of exterior that you see in many images. Wattle, or woven strips of wood, are covered with a primitive plaster-like material called Daub. Daub consisted mostly of sand, clay, mud, straw and animal dung. This would harden into a single, solid shell around a house, keeping out most of the weather in a given area, though it wasn’t particularly insulated. The house would then be coated in a lime based whitewash to give it a final, appealing look. City houses are generally the same, but they dabbled in a very specific type of building style called Jettying. Jettying is a form of building where each successive floor is larger than the last. Often, the first floor would be build of stone, opposed to wattle and Daub, to showcase how wealthy and important the owner was. The flooring could also be stone, and that would shoe how exactly important you are as you used expensive and heavy stone to just walk on! I love this video for explaining how it all works. Its not perfect, but you get the idea. 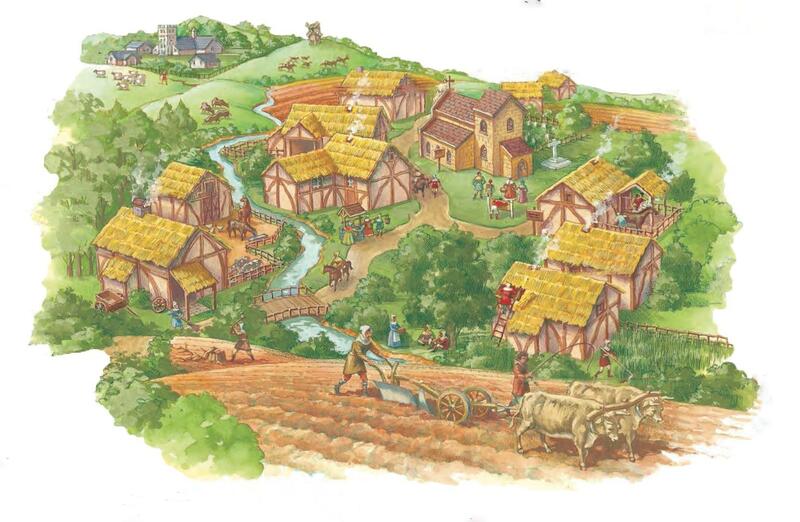 Each floor after the first, though, would be made of the lighter wattle and daub in order to reduce the weight of successive floors and enable a taller house to be build with a single, stable foundation. In many cities during these times, the buildings grew so wide and so close together that there was but a sliver of sky to be seen from the road, if that. This was further filled with smoke from hearths, waste from humans and animals, and other, somehow less savory things. Cities were a crowded space, much more than we have now, because of many small situations compounding with each other. I dare say that I have no idea what an urban center in 1300 Paris, or London, or Austria would feel like, without having been there. These houses, so close together and built of extremely flammable material – the same as the rural houses, made cities very dangerous to live in, and fires a very real threat. I’m really disappointed at the lack of information I can find on how buildings in the cities were built, maintained and even created. Maybe I’m just bad at finding it, but urban life and urban information for the middle ages is hard to come by, and I can guess why. The dark daytime life, a general disregard for life, the oppression of the nobility, fear of illness and an ever present threat of fire burning the entire city to the ground, and you don’t so much have that chipper, up-and-coming city life that we do now. Everything was likely dark and dour, living from brief miserable moment to the next. Who’d want to record that!